This Pizza alla Siciliana is loaded with a light and fresh sauce, as well as the flavors of anchovies, roasted artichoke hearts, and prosciutto. 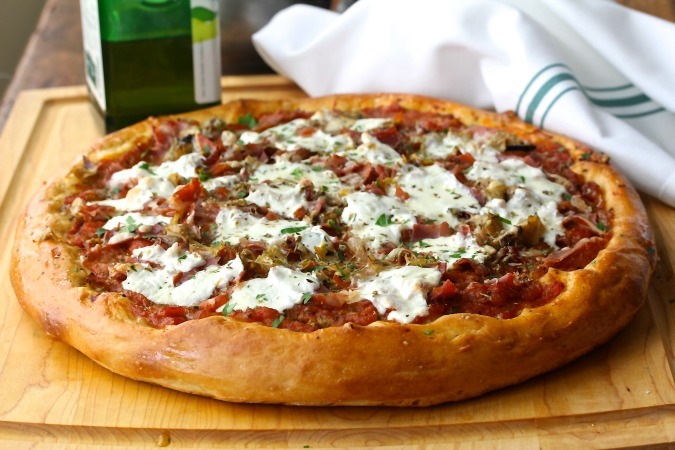 It's topped with thin slices of fresh mozzarella cheese. 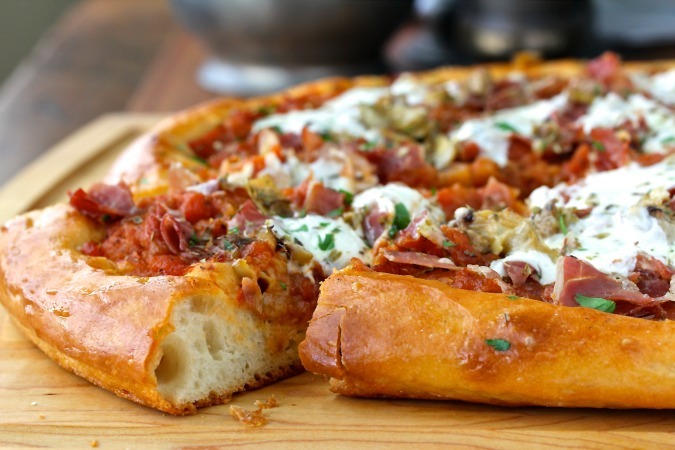 Pizza alla Siciliana is made with a thick airy crust, similar to a focaccia. The bottom of the crust is crispy and, unlike most pizzas, there is a much higher amount of sauce vis-à-vis the cheese. 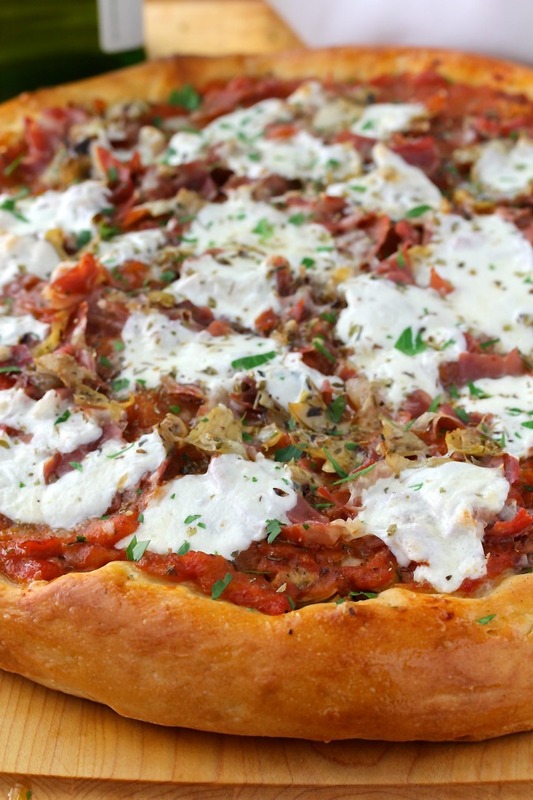 This pizza was inspired by the pizza of Palermo, the capital of Sicily. The unifying characteristics of Sicilian pizza are that the crust is crispy on the outside and soft on the inside, and it is piled with a lot of tomato sauce flavored with a hint anchovy. In fact, there is so much tomato sauce, I had no idea how I'd use it all. Thankfully, I did, and was so happy with the results. This was one of those jump up and down, "I can't believe I actually made this deliciousness!" recipes. It's that good. I kept slicing off thin slivers of this pizza to eat after dinner, fooling myself into thinking that they didn't count because they were so thin. Have you ever done that? If you think you don't like anchovies, please suspend judgment. You don't actually taste them (or even see them). Instead, they enhance the flavor of the pizza and the sauce. The pizza can be shaped into a rectangle or a round, and can be baked in a pan or on a baking stone. I used a dark round 14 inch pizza pan, which I placed on a preheated pizza stone. I shaped the dough right on the pan, which made it so much easier to move it to the oven. You can also slide the dough directly onto the stone from a pizza peel if you prefer. You can make the sauce a couple of days in advance and keep it in the refrigerator. A little hint on peeling the tomatoes: While the onions are boiling, cut one shallow slit into the skin of each tomato, and drop each, one at a time, into the boiling onions for one minute. Fish them out of he boiling water with a slotted spoon, and peel. The skins slips right off. This month, the Bread Bakers are making Italian breads. thanks so much to Anshie of Spiceroots for choosing this great theme. I do have a lot of Italian breads on this blog, including Pane di Genzano (which got me into trouble with the Italian bread police), L'Otto di Merano, Pane di Pasqua, and many other Italian bread recipes! 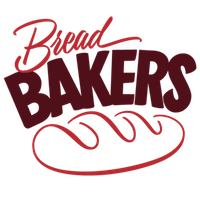 After the recipe, be sure to check out all of the links for more delicious breads. To make the sauce: Simmer the onions in the water in a 4 quart saucepan for an hour, covered. Add the tomatoes, tomato paste, olive oil, and the anchovy, and simmer for two hours more, covered. Let sit until it comes to room temperature. Strain the sauce in a fine mesh strainer to remove excess liquid, and refrigerate until ready to make the pizza, up to two days. To make the pizza: Add the yeast and the sugar to the bowl of a stand mixer, add the water, stir, and let sit for 10 minutes. Add the lard to the bowl, and mix with the paddle attachment. Add the salt and the flour and mix with the paddle for two minutes. Switch to the dough hook, and knead on medium for about 4 minutes. Place the dough into an oiled bowl, cover, and let rise until doubled, about an hour. Push the dough down, and let rise for 20 more minutes. Preheat the oven to 425 degrees F with a pizza stone in the oven if you have one. On a lightly floured work surface, shape the dough into a ball, and then flatten into a disk. Place it on a lightly oiled pizza or half sheet pan, and stretch it out to the edges of the pan. The dough should be about 1/4 inch thick with a thicker (about 1/2 inch) edge. The dough will rise quite a bit in the oven. Evenly sprinkle the anchovies over the top of the dough. Sprinkle half of the provolone and 3/4 of the artichoke hearts over the dough. 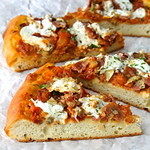 Spread half of the tomato sauce over the dough and sprinkle with 1 1/2 teaspoons of dried oregano. Sprinkle with the salt and pepper. I used the smaller amount of salt. Drizzle with the olive oil and top with the rest of the tomato sauce. Place the pizza pan on the baking stone, and bake for 20 to 25 minutes, until the crust is crisp on the bottom. Take the pizza out of the oven, top with the prosciutto, the rest of the artichoke hearts, the mozzarella, and the rest of the oregano and provolone. Return the pizza to the oven, and bake for another 10 minutes, until the cheese is melted. Brush the outside crust with olive oil as soon as you remove the pizza from the oven, and sprinkle with the parsley. Slice and serve! This recipe was adapted from The Italian Baker by the late Carol Field. The book was first published in 1985. It covers the entire range of Italian baking. You can read more about the author here. Hello Karen, What a delicious Pizza with lovely colours and flavours. I loved the recipe of the sauce too. A very useful tip to remove the skin of the tomatoes. I am going to get in trouble with the Italian bread Police as well for the Pane di Genzano. LOL! I LOVE LOVE LOVE everything about this pizza. The anchovies, the crust, the lot of sauce and hey eating thin slices of pizza does NOT count into the total calorie intake ;) It's worth it sometimes!! Thank you for participating with this deliciousness this month. Oh thanks so much Anshie. I will protect you from the Italians! Do you remember Snuffles the Dog from the Quickdraw McGraw cartoons? The one who went nuts over dog biscuits until he floated up into the air in total ecstasy? Yeah, that would be me looking at this pizza right now. You really need to deliver. I know it's a long way but as I keep telling you, I tip really well. Definitely enough to bail you out of Italian bread jail. I do remember! Thank you so much my friend! I would totally love to share a slice of this with you! I'm hungry but wanted to get my comments in before dinner. It's not going to happen. Just looking at this pizza has me famished! I wish that was on my table. The crust looks just amazing and perfectly backed. I'll be trying this one soon! Thanks Julie! I hope you enjoy it as much as we did! WOW! This sounds incredible! I can't wait to try it for myself! Karen...you have me jumping up and down looking at this pizza! It looks pretty amazing. And I love anchovies that just melt into the sauce! Beautiful photos, as always! Thanks so much Anne. Anchovies add so much "umami" to the flavor. You made my day. That makes me so happy that a Sicilian approves!! Thank you! My Big sister is one of those kind of person that she has to say what she think..lol. Home made pizza sauce is the best as one gets the taste of tomatoes unlike the ready made ones. I so love the airy crust. Next time I will try and just push it instead of rolling. I guess in rolling it the gas comes out. Thanks Mayuri. this dough was a bit too sticky for a rolling pin as well. The dough was much thinner when it went into the oven than when it came out. Beautiful crust and a lot of flavors. What exactly do you mean? If I ever sliced something in a way that it would be not noticed by someone else living in the same household? Not only super thinly, but in angles that fool the brightest detective? No, I've never done that. The photo of your pizza is making me drool. And I just had lunch. wow!!! !I am bookmarking this. Looks absolutely gorgeous. Loved the pic!!! Wish I could get a slice of this beautiful pizza Karen, feeling hungry now.. Thanks Sneha. I am kind of craving it myself! Oh, thank you! Let me know when you do. This looks FAB!!! great job! YUM!!!!!!!!!!!! I actually do like anchovies, and this looks absolutely divine to me!! That is one gorgeous and delicious looking pizza. It looks like it's from a pizza parlor -- awesome clicks. I am so happy you shared this again for First Monday Favorites. How did I miss it in the Bread Bakers event?! Thanks Wendy. So glad I could lure you back! Nice choice for your favorite of April! WOW!!! !Now I'm craving Pizza. That just looks so good. Thanks for linking it to First Monday Favorites. Thanks Sid! It's really tasty. what a fabulous pizza! homemade pizza is really the best... and so customizable. yum!